There must be something in the water at the Delft University of Technology in the Netherlands. Home to the team that won the original SpaceX Hyperloop competition in January 2017 with the best overall pod, the university has produced another team of innovators ready to shake up the aviation space. Team Silverwing, one of five winners of Phase II of the GoFly Prize, has built an electric flying motorcycle designed for autonomous flight at speeds topping 60 mph. Not surprisingly, Delft’s engineering and aerospace departments have become world famous, with faculty and staff involved in a number of high-profile projects. 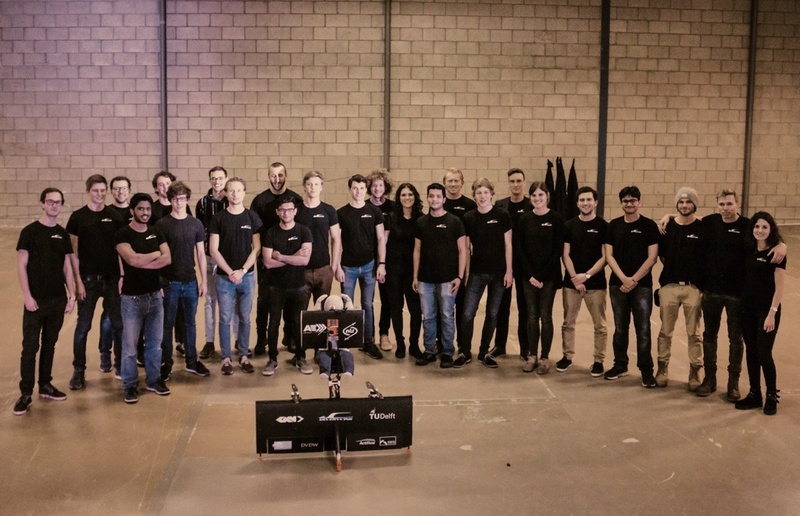 So when Silverwing Team manager James Murdza and technical manager Victor Sonneveld learned about the GoFly Prize and set out to build their device, the S1, the two had plenty of talent to recruit, including a few Hyperloop veterans. Silverwing is one of the bigger teams to win Phase II of the GoFly Prize. It’s currently made up of about 30 members and counting, including students and professors from 10 different countries with expertise in eight different disciplines across six of the university’s engineering faculties. Despite its size, Silverwing is a tightly-knit family, Murdza says—a family unified in its aim to get their S1 prototype scaled up, fine-tuned and ready for GoFly’s Final Fly-Off in 2020. Mentorship has played a critical role for Silverwing, as the team makes a continued effort to consult with university advisors, manufacturers, and GoFly Masters—including Dr. James Wang, senior vice president of Leonardo Helicopters and the former vice president of research and development at AugustaWestland. Known as the “Steve Jobs of Rotorcraft” by those in the industry, Wang has shared his expertise in helicopter design and advised Silverwing on how to design test flights and use different-scaled models to build up to a full-size version. Meanwhile, when it came time to optimize the propellers for the S1, Silverwing turned directly to their manufacturer for insight. “We knew the company that made them would have the best insight into what would work, so they helped us find the right dimensions of the blades for our device. We’ve been working with manufacturers a lot in this respect, so you could say that they’ve become our advisors as well,” Murdza explains. Internally, the team is brimming with subject matter experts too, including electrical engineers, industrial designers and aerospace professionals who were instrumental in building Delft’s Hyperloop pod. “There’s a tremendous amount of cross-collaboration and mentorship that takes place within the team, especially because we represent various education levels,” says Murdza. For Silverwing, Phase II of the GoFly prize was all about testing and analysis. Because one of the Phase II requirements was to log actual flight time, the team was determined to get its half-scale model up in the air as much as possible. Yet even this large team struggled with the amount of time and volume of resources needed to execute successful test flights. The team also considers itself lucky because so far, things have managed to “work out,” just in the nick of time. But what Sonneveld attributes to luck is more likely the work of tireless perseverance. One “lucky” moment came just before the Phase II deadline when the team was executing a critical test of their new electric motor. Silvering knew they were cutting it close with testing, but logging the flight hours was vital, so they spent 12 hours in a freezing cold F-16 aircraft shelter testing the device—and it was a success. “It was a really tough day but the result was so satisfying. It made it all worth it,” Sonneveld says. Team Dragonair’s project manager Mariah Cain gained first-hand experience in turning creative spark into tangible projects at a young age, growing up in her grandfather's machine shop. Eventually, she moved out of her small town and began working at a 3D imaging company in Arizona. There, she became interested in Hydroflight, a competitive sport in which athletes maneuver around on water-powered hoverboards connected to jet-skis. It was through their mutual interest in Hydroflight that Cain met her now-teammate Jeff Elkins, who was working to marry the technology behind Hydroflight devices and drones to develop a new class of personal flyers. Far more than just an enthusiast, Elkins, who has been called a “mad scientist” by his peers, is a drone pilot with extensive engineering experience, having designed everything from prosthetic limbs to architectural renderings. His expertise, along with Cain’s own growing interest in Hydroflight and personal aviation, drove Cain to move down to Florida and get serious about what she once considered just a hobby. There, she started working closely with Elkins and his colleague Ray Brandes on Elkins’ most ambitious project to date—the Airboard, a flying device that gets its power from eight motors and its maneuverability from the human body. Over time, a true team took shape, complete with a clear vision, engineering prowess and perseverance. But making a flying device is a monumental challenge, not to mention the work that goes into securing funding, gaining industry recognition, and attracting public interest. As project manager, Cain knew she had to find ways to make these critical elements come together—that’s when she heard about the GoFly Prize. Though the GoFly Prize challenge was issued in September 2017, Cain and her colleagues only learned about the opportunity in April 2018. Having missed the Phase I submissions deadline, Cain, Elkins, and Brandes joined the competition during Phase II, incorporating as team Dragonair and completing their entry just in the nick of time. Their device—now called the Airboard 2.0—has undergone many iterations even before Dragonair joined GoFly, but the team had to make a number of new key changes to be considered for Phase II. They needed to make their prototype smaller, boost flight time without overloading the device with heavy batteries, and obtain new test parts for their improved model. Through it all, Cain has played a major role in experimentation, flying the Airboard using her body movements to control it—just take a look at her impressive flight on YouTube. “Many people ask me if it’s scary to fly, but because of all the safety stabilization, it feels natural. 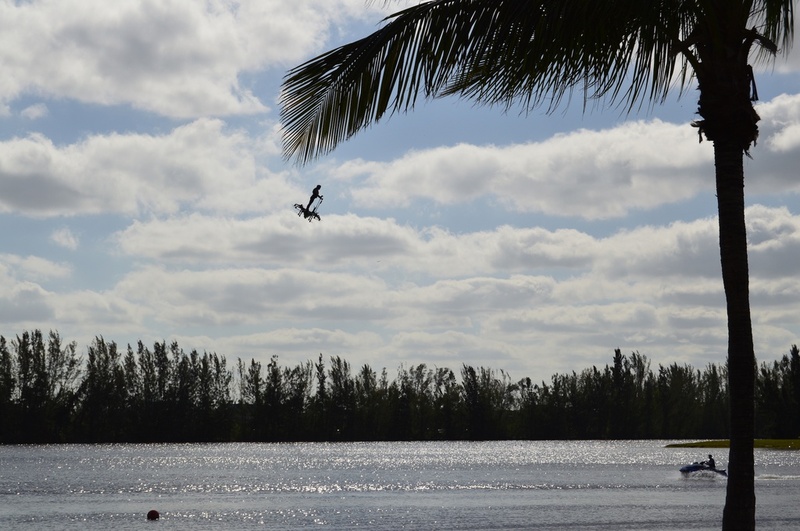 It’s exciting to be one of the first women involved in this style of flight. I’m grateful that I get to be a part of such a unique field at such an incredible time in history,” Cain says. Creating the feeling of freely flying through the air, uninhibited by a massive device, was a big factor in Dragonair’s design process. “The Airboard enables you to interact with the natural world around you. It’s very empowering compared to other technologies that take away from the human connection with nature. The Airboard’s design allows the pilot to feel like they are one with the device, informing its motion by shifting their weight it in a standing position. Once people get a taste of what it’s like to fly these things, they won’t be able to get enough,” Cain says. Don’t let the team’s focus on pure human flight fool you, though—for Dragonair, safety is a major priority. 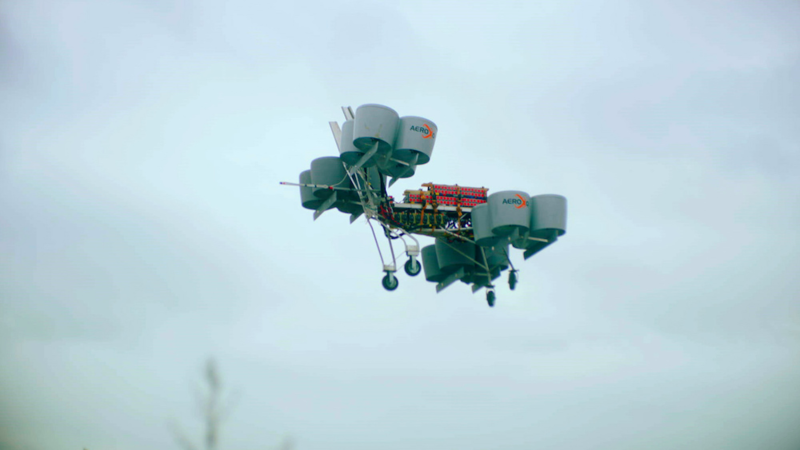 Already, the device has a mechanism in place where it can continue to fly even if up to four of its eight motors give out. In total, there are three tiers of safety conditions in place to ensure that flights are safe. For example, there will be two separate parachute systems installed (one for the pilot and one for the device). As futuristic as the Airboard may seem, it’s becoming real faster than Dragonair had imagined. Cain and Elkins say that the progression from unmanned drone to personal flyer is inevitable, especially once people can envision all the possible applications of these devices. So how does team Dragonair expect the Airboard to be used? Recreation, of course, will be a big draw. But Cain has loftier ambitions as well: “We need to get more girls on these devices to show the world what women can do,” she says. Personal flyers can even drive change in the agricultural space, where the eradication of harmful plants is currently not done in the most environmentally sound way. Today, aircraft with limited targeting capabilities spray harsh chemicals on massive areas of wildlife, killing not only certain flora but also their surrounding ecosystems. A heavy-lifting drone—manned or unmanned—can execute that task more sustainably simply because it can get lower to the ground and aim more precisely. Vladimir Spinko isn’t the first to dream of a world where the speeder from the famous forest chase scene in Star Wars: Return of the Jedi truly exists—but he is among the first to actually build something resembling it. One of five winners of Phase II of the GoFly Prize, Spinko and his nine fellow members of team Aeroxo have successfully built a working prototype of the ERA Aviabike (which Spinko describes as “a flying motorbike”) and are working towards making a full-size device ready for the GoFly Prize Final Fly-Off, set for early 2020. Back in 2007, the Moscow Institute of Physics and Technology graduate was working at investment firm I2BF Global Ventures as an analyst, handling deal sourcing, assessing technology and performing due diligence. But he wanted to do more than help fund new technology. He wanted to create it. So, armed with colleague Eldar Razroev’s idea for the first-ever small commercial tiltrotor UAV (unmanned aerial vehicle) and an early investment from I2BF’s Ilya Golubovich, Spinko and his tight-knit team co-founded Aeroxo in September 2014. Spinko and Aeroxo’s other founding members Golubovich and Razroev got to work immediately, assembling a team of seasoned experts, eager second-year students and other contributors from across Moscow and Kazan who were capable of actualizing the tiltrotor UAV Spinko envisioned. But for about two years, the team struggled to get the device off the ground—literally. It wasn’t until the fall of 2016 that Aeroxo’s Moscow-based engineers executed their first successful test flight, lifting into the air a drone that looked very different from the team’s original design. “That’s when we learned an important lesson: an ugly drone that can make transitions and fly is much better than a beautiful model that can’t take off,” Spinko says. By 2017, the team was ready for the public to see their creation. Although they were hesitant to take their drone out of the safety of their lab where equipment and spare parts were at their fingertips, Aeroxo brought it to an exhibition in Austria, where the tiltrotor UAV withstood the test of a 2000km flight. The team knew then that they could take the device to the next level. “Our first step was to participate in a challenge to create a large passenger drone or aero taxi,” Spinko explains. “Our design made it to the finals, but failed to win. Still, at this point, we had never built anything larger than a 35kg drone. This was our first attempt to build something that could carry a passenger, so this was a big step forward for us.”. Eventually, the team found itself building a flying passenger vehicle that took on many different forms—a drone taxi capable of carrying several people, a small SUV with motors and rotors capable of driving and flying, and several other designs. But this wasn’t the team’s forté, and Spinko knew it. “We had never set out to build a flying car,” Spinko recalls. “We had our tiltrotor and that’s where we needed to direct our focus. And then we finally had our breakthrough realization: why can’t a pilot just ride a large tiltrotor?” The team’s aerodynamics expert put together an early sketch of a rideable tiltrotor resembling a motorbike, and the rest is history—or perhaps, the future. Eager to get their design in front of industry experts from Boeing, Pratt & Whitney and others, Aeroxo prepared to enter the ERA Aviabike into the GoFly Prize, but knew they had to get input from expert users first. The team solicited the input of professional bikers, welcoming their feedback on everything from the driver’s seat design, to the maximum speed and potential cost. Now a Phase II winner with a working prototype, Aeroxo continues to make improvements and inch closer to a full-size device, but the journey only gets more challenging. Though their signature tiltrotor has gotten them this far, Spinko says that the team is coming to terms with the fact that for a full-size model, the tiltrotor will have to be redesigned. “We’ve gotten some data back from field tests, and we now know that we need to make a number of modifications, including altering and finetuning our wingspan and number of wings, in addition to redesigning the tiltrotor mechanism,” Spinko explains. GoFly’s size requirement, which states that the maximum single dimension in any direction between two planes cannot exceed 8.5 feet, not including the operator, has been Aeroxo’s greatest challenge thus far, and Spinko anticipates that it will remain the toughest criteria for the team. “We’ve been pleasantly surprised in some ways. Our prototype is virtually silent, for example. It’s 10 to 15 percent quieter than we predicted. But the size — that’s going to be a hurdle,” he says. Nevertheless, the team is determined to debut the full-scale ERA Aviabike at the GoFly Final Fly-Off. And from there, the possibilities are vast. Whether the device is primarily adopted by the biker community as a recreational vehicle, or becomes a search and rescue staple that helps first responders save stranded climbers in the corners of the Swiss Alps not accessible by helicopter, Aeroxo knows ERA Aviabike will transform transportation. It’s only a matter of time. The SI is a canard-wing configuration around a person in motorcycle-like orientation powered by two electric motors with ducted rotors. The aircraft makes a 90 degree transition from vertical take-off to horizontal cruise flight. There is still plenty of time to participate in Phase III and you do not need to have participated in Phase I or Phase II in order to qualify. 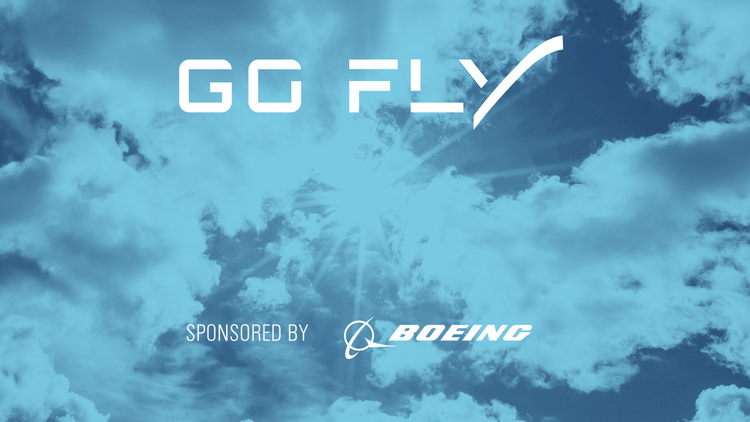 To learn more, please contact GoFly at phase3@goflyprize.com. 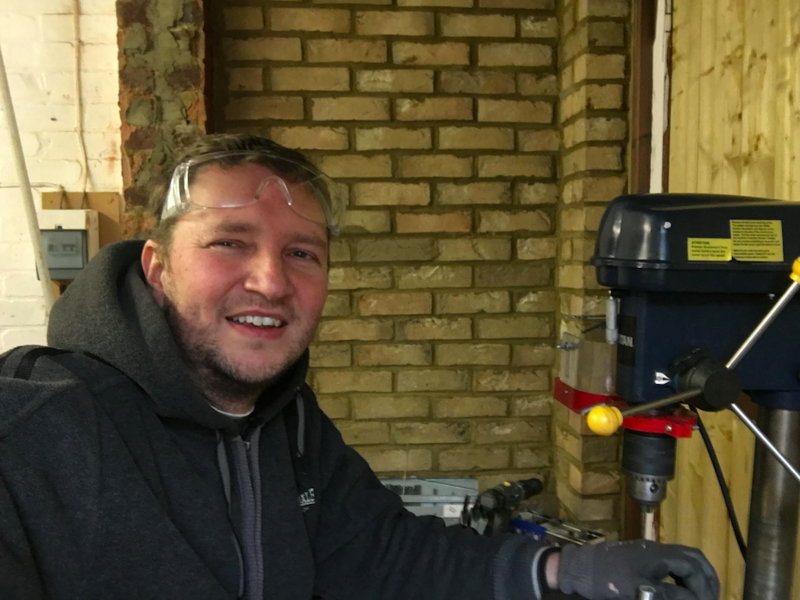 When I took my first job as an engineer’s apprentice, I had already decided that I wanted a career as a designer. They started me out in the sheet metal shop and then from there I worked my way around all the manufacturing facilities, working on composites and electrical as well as in the machine shop and tool room, on the assembly line, and in the test centre. When I finally arrived in the design office, I knew that was where I wanted to be. I have a full time job and the biggest constraint on me so far has been time. I would really like to expand the team and take on more members. It would be great if someone could do some work on the device graphic, for example. I was really impressed by the graphics submitted in phase I and my team is desperate for someone to improve our graphic. Our safety assessment also requires a lot of effort, because we need to prepare for the flight readiness review. The document is currently just a shell and we need to rally around it as a team, or introduce an additional team member to coordinate our safety reviews, keep the hazard log up to date, and conduct risk assessments and zonal hazard analysis.